All step and servo drives with Ethernet ports, including ST5-Q-Ex, ST10-Q-Ex and STAC5 stepper drives, and SV7-Q-EE and SVAC3 servo drives. For standard Ethernet firmware (i.e. non-EtherNet/IP firmware) your drive must have firmware build 19 or later to upgrade firmware using the instructions below. The build number of your drive firmware can be determined using the Ping button in the ARM Firmware Downloader software (see step 4 below). New ARM firmware periodically becomes available for the drives listed above. Any customer wishing to take advantage of a firmware upgrade can, at their option, use the instructions below to reflash their drives(s) to the latest firmware version. 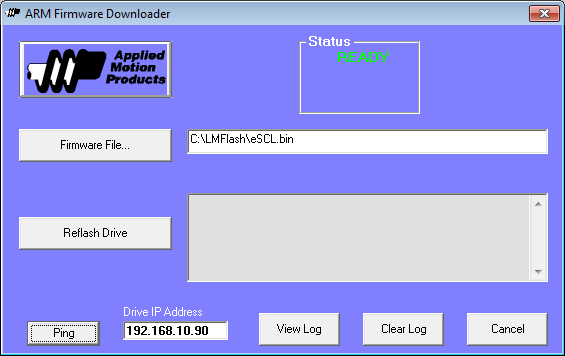 Install the ARM Firmware Downloader software, which is available for download here. During installation a shortcut to launch the software will be placed in Start Menu, All Programs, Applied Motion Products. If you don’t already have the latest ARM firmware file for your drive, contact Applied Motion Products at 1-800-525-1609 to request it. Note that each of the drives listed above has a unique firmware file. Make sure that the drive you wish to upgrade matches the firmware file you are attempting to download. 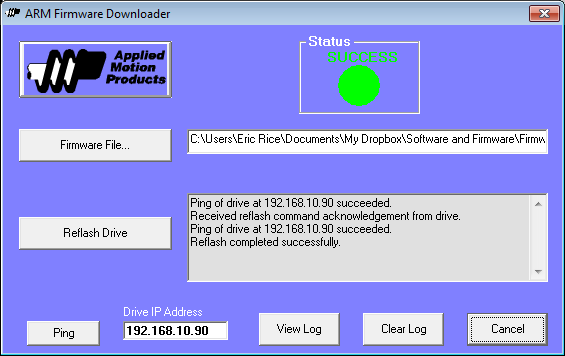 Launch the ARM Firmware Downloader and enter the IP address of your drive. Connect your drive’s RJ-45 jack to an Ethernet hub, switch, or router to which your PC is also connected. You may also connect the drive directly to your PC. Power the drive ON and click the Ping button. If the drive is properly connected and the correct IP address has been entered you will see a message appear like the one below. Open the firmware file for your drive by clicking the Firmware File… button. Download the firmware to the drive by clicking the Reflash Drive button. The Status indicator will display SUCCESS when the download is complete. At that time you can power down the drive, disconnect it from the PC, and return to your application. Repeat steps 3 through 6 for all drives that you wish to upgrade. For more information on your Applied Motion motor drives and other products contact Applied Motion directly at 800-525-1609 or [email protected].